Have you ever stopped to think about what happens to your bottle after you drop it off at a recycling center? Honestly, I never did. I knew recycling was a good thing to do. Here in Maine, we get our bottle deposit back if we recycle our bottles. We have our recycling bin beside our garbage bin, so recycling bottles is easy to do in our house. Then every few weeks, I take the GREEN bag to the grocery store and drop it off at the recycling center. A few days later, I can check my account balance. I can either use get the cash or use it on groceries. I tend to just use the balance on groceries. But clothing made out of bottles? Now, that's a really cool and awesome idea. And, even better? REPREVE is a recycled fiber that helps turn plastic bottles you recycle into cool stuff you can wear and use every day. Now there's no excuse to not recycle!!! Other great brands that use REPREVE in some of their products are: The North Face, Polartec, Patagonia, Beija-Flor, Lauren Conrad's XO (eco) by Blue Avocado, Swiftwick socks, and many more!!! So...what I want you to do is share it with the world, how YOU #TurnItGreen for your chance to win $5,000. But, please!!! Don't tell Ward that I have this super warm and cool REPREVE beanie. I'm so tired of him stealing all of my cool things. PS. My video will be up tomorrow! 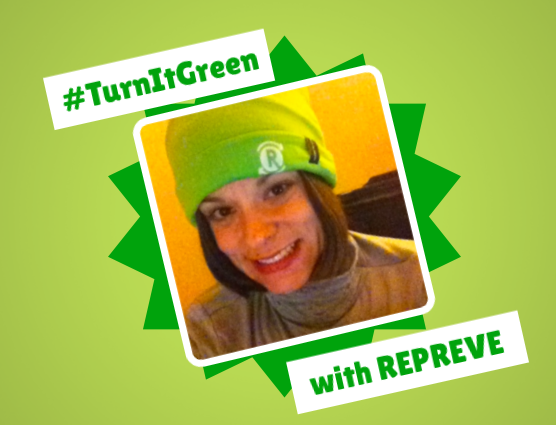 I am so excited to partner with REPREVE in this sponsored post and share with you how to #TurnItGreen! those are some awesome prizes, the Go-Pro camera would be so fun to have! I know!!!! I would LOVE to have the Go Pro camera!